Sometimes we wonder why God allows certain things to happen; things like pain and suffering. Job’s suffering was a test to his integrity; but he chose to worship God even in the midst of pain and suffering. He never cursed God for the things God allowed in his life. We struggle with the question, why does God allow pain and suffering in this world? Why do you and I go through rough times in this world? In Scripture you find answers to the problem of pain and suffering. In Scripture we find that God has a plan in allowing us to go through certain trials. We rather not go through trials or painful situations but the reality is that as long as we live in this fallen world, we will have difficulties. Then I find encouragement in the fact that God still has a plan, even in my painful situation. If he is truly in control, then I must trust he has a plan even when I may see it; God has a plan in allowing us to go through trials in this life. Remember that God can make something beautiful and meaningful to come out of this ugly situation you are in right now. Count it all joy (consider it pure joy my brothers) whenever you face trials of all kind. The rejoicing is because of what those trials produce. Student don’t rejoice when they are given homework; but the effect of the homework is that they will rejoice for completing it and joy in moving up to the next level. Trials are a test to your faith; this testing produces perseverance (endurance, steadfastness). When perseverance is full grown then it produces completeness or maturity in that person. You will never know how strong your faith is unless you go through trials. It is those difficulties, hardships that will show the kind of faith you have. Those trials will develop your faith all the way to maturity. God has a purpose in letting us go through trials. 1 Pet 1:3-7 Peter says that trials show how genuine your faith is. Our faith is gold that goes through the fire to be refined. Trials will refine your faith. Job recognized that refining purpose of God in trials. Job 23:10 But He knows the way that I take; when he has tested me, I will come forth as gold. Suffering (tribulation, affliction, distress) produces perseverance, perseverance character and character hope. Paul says that a hopeful person is one whose character has been developed by the trials they have endured. There is purpose in the trials we face. The Brooklyn Bridge opened to traffic on May 24th, 1883, People didn’t trust the bridge too much but a year later on May 17 1884, The Brooklyn Bridge was tested by walking 21 elephants, 17 camels across. After that people thought the bridge to be safe for the public. After this most New Yorkers were not afraid to go on the bridge for it had passed that test of endurance. 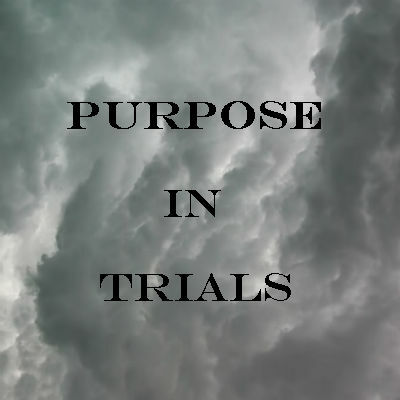 God has a purpose in the trials we face in this life. They come to test how genuine, true we are as his followers. We profess to believe or trust God; the trials test our faith; God uses these trials to build our character, to build our resistance in life. God allows these hardships to come to us to make us into the people he wants us to be. The writers of the New Testament rejoiced in the effect those trials produce. Stronger faith, perseverance, maturity, proven character and hope. It’s no fun to be taken through the refinery, but after you have gone through it, you will come out shinier than ever. God is always working in us, even in those painful trials we face. God has a purpose even in the trials you are facing.